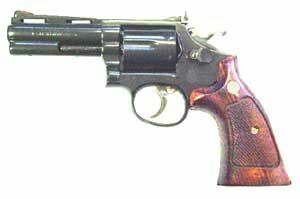 Take a 4" barrel from a Colt Python and the frame of a Smith and Wesson revolver, put them together and you have a "SMOLT". The engineers of Armtech, Amsterdam(NL) did it! The reason: the good looks of a Colt barrel and the flawless functioning of the S&W mechanism.